We have taken our current Wall FTS design and made some additional features to accommodate customer request. Uprights for adjustable J-hooks, Olympic plate storage, and High cross bar for rings and climbing ropes. 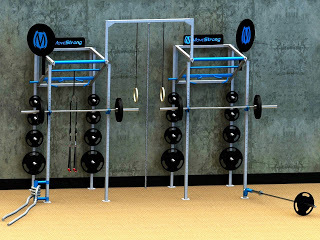 These floor space efficient Functional Training Stations allow for the unique MoveStrong pull-up bar options such as Fat bar grip, Globe Grip, Ergo grips, and standard pull-up bar options. 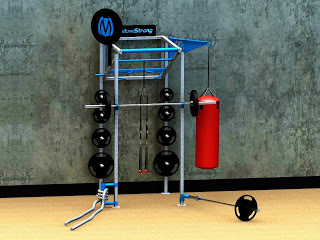 Add Ground Rotational Trainers, Training Rope anchors, Medicine ball targets, and Heavy Bag anchors as well. These designs allow for traditional exercises mixed with functional strength movements for group workouts. Build as large or small based on your available space. All MADE IN THE USA! Contact Us to get started on a design for you!